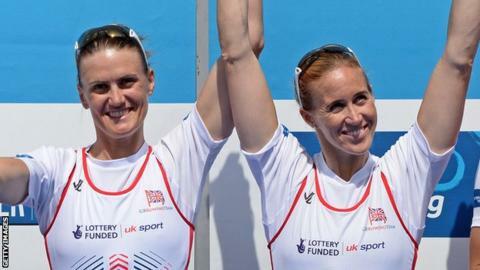 Olympic champion Helen Glover says she is in the best shape she could be going into this month's World Championships. Glover is unbeaten since winning gold with Heather Stanning at London 2012, and the pair will defend their world coxless pairs title in France. "When I look back at the last three years since London I'm in as good a place as I could have wanted to be," Glover told BBC Radio Cornwall. "There's nothing I'd change about where we are right now with a year to go." Glover and Stanning are the firm favourites for gold in Aiguebelette, having won the European title in record time in May and taken gold in the second World Cup regatta in Italy a month later. "When I left London 2012 I was very ambitious and I immediately knew that I wanted to move on to 2016, but to be unbeaten three years on is not something that I necessarily thought was possible," she added. "I didn't want to accept any sort of defeat - I wanted to keep on thinking if I've managed to become Olympic champion and I have my sights set on the next Olympics, then clearly I want to keep winning. "But, having said that, the Rio Olympics is the one that's important, so although it's been great and incredible to have done what we've done so far, we know that the biggest challenges are definitely yet to come."